I would have to check who the Japanese casualties were, but these brave Marines did more than harass the Japanese attackers. Much like the German Luftwaffe, the Japanese Naval Aviation flew pilots until they were killed or lost – no retirement after a certain number of missions, as was common among Allied forces. And the Japanese had a slow turnout of pilots, so losses at Pearl Harbor and Coral Sea were still felt at Midway. Plus, every Japanese fighter shot down weakened the CAP over the carriers when the dive bombers hit. So much we owe them. Something I’Ve always wondered about these “brave men”. They grew up in an era of “dog-fights” a-la-Eddie Rickenbacker and the “Hat-in Ring” Squadron. 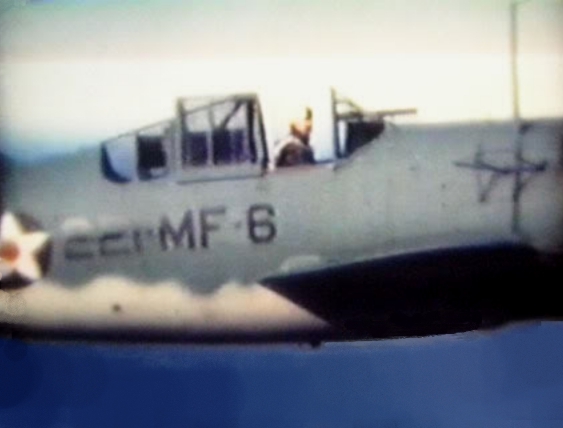 I wonder if they had the benefit of “Thach” who fought Zeros in the F4U Wildcat, and if they knew enough to know that they stood NO CHANCE against a Zero, unless they had altitude, and could DIVE on the Zero and get the heck out of Dodge to live to fight again. My guess is that these brave men were too brave for their own good, that they hadn’t been told about Thatch’s experience with the Zero fighter, and that they paid the ultimate price for their Government’s supplying them with obsolete and inferior equipment, not to mention failing to tell them what tactics they should use to try and stay alive. Ashton O’Dwyer. Thanks for the comments….sad that the Marine Pilots had to fly the F2 Buffalo. They stood no chance against the veteran Japanese pilots in the Zeros. As Don Rumsfeld said “you go the war with the Army you have.” A fwq months later they would have at least had F4Fs. The Marines flying them at Guadalcanal did very well. Yeah, except that Rumsfeld made his comment when we were the best equipped, best trained fighting force in the world. There was NO excuse for not sending our people into the Gulf Wars or Iraq or Afghanistan with anything less than they needed to fight and win. This wasn’t Bataan in 1942. We suffered in the early days of the WW2 because Jap pilots already had combat experience, and we didn’t have our aircraft act together until the F6F and F4U’s came into operation. Rumsfeld’s comment in our modern day military was stupid and inexcusable, given the absolute superiority of our people and available combat resources. The men at Midway still performed brilliantly despite not having aircraft or numbers superior to the Japanese INAF. I can only say Amen to everything that you said. You should see some of my views on Rumsfeld in other articles and things that will not be written. Ashton – The Thach Weave was just starting to be experimented with by the Navy at Midway. The Marine Corps wasn’t aware of it at Midway, and even if they had, the Buffaloes were far too pathetic in performance for it to do much good. The Marines tended to get the airplanes they Navy didn’t want – a point that backfired horribly on the Navy when they determined the F4U Corsair “too hot” for carrier landings. The Marines sure proved them wrong! I am a relative of 2nd LT David W. Pinkerton, Jr. who was MIA in a/c MF5 BuNo 01569. I have been researching this event several times. This is the first time I have been able to see a photo of VMF 221(at Ewa). I believe he is the last one on the far right in the back row of the photograph, but can anyone verify this for me. He was my Uncle’s cousin. My Uncle passed away June ’05, he served on Nimitz’s staff. I have been researching VMF221; their gallantry at Midway. My Uncle’s cousin was 2nd Lt. David W. Pinkerton, Jr. who is listed as MIA in a/c MF5 BuNo.01569. 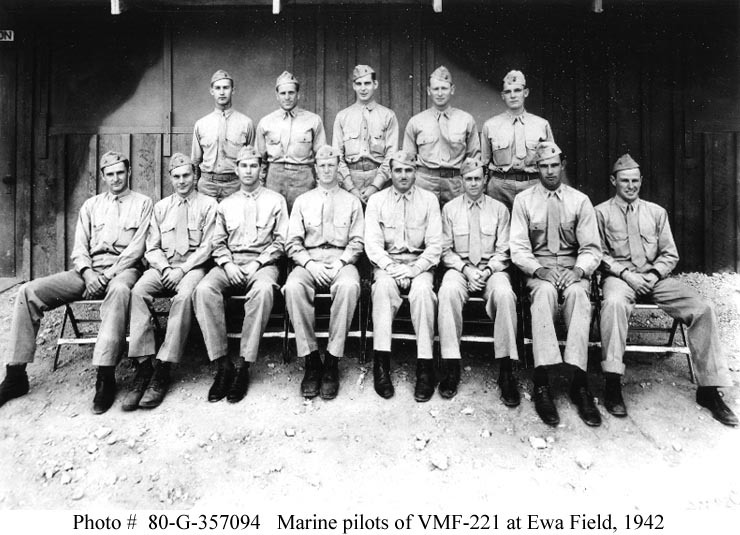 I have not been able to find a photo of VMF 221 until this site. I believe 2nd Lt. Pinkerton is the last one to the right in the back row, but need to have anyone please verify this, or identify him for me. If I ever find out anything more specific I ill let you know. I ask any readers with knowledge of this to contact John to assist him if you have any information. Thank you John for your Uncle’s service to this country and I hope the information becomes available to you. John- I am a member of a board that discusses never-built and planned warships from 1900 onward, and the board has a number of VERY knowledgeable people. If you wish, I can post your request on that site, and ask for information. I can weed through the responses, and pass whatever info they provide on to you. It would be my honour and pleasure to help out any way I can. And please add my gratitude to Padre Steve’s thanks for your family’s services. Their sacrifices are deeply and eternally appreciated. 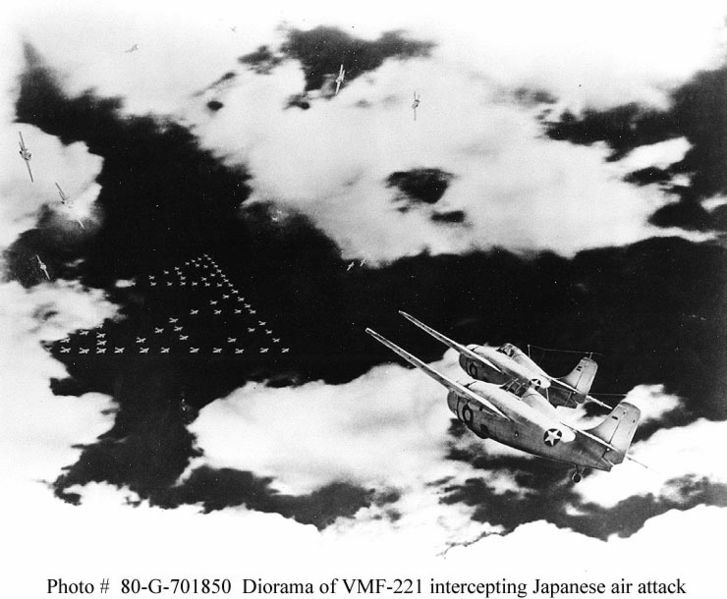 According to the books I have read, the most commonly agreed figure for the number of Japanese aircraft that VMF-221 shot down over Midway on the morning of June 4th is five, possibly six. Namely four, possibly five Nakajima Type 97 B5N2 ‘Kate’ level bombers and one, possibly two Mitsubishi A6M2 Zero fighters. Anti-aircraft gunners on Eastern & Sand islands downed another four- two Kates, a Zero and an Aichi D3A1 Type 99 ‘Val’ dive-bomber. Not all historians agree. In his 1976 book ‘Midway’, Peter C Smith asserted that VMF-221 gained no kills and all of the Japanese losses were due to ground fire. But other historians such as Gordon Prange and Hugh Bicheno tend to agree on the above figures. 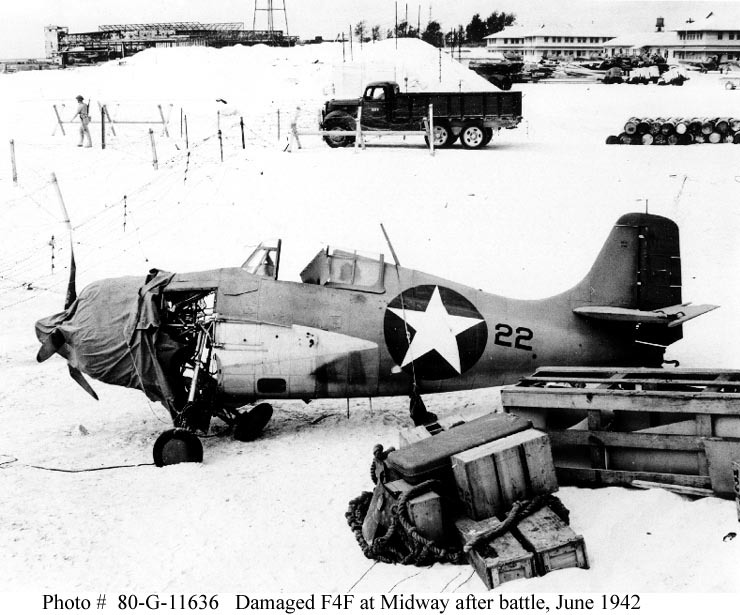 And a lot more Japanese aircraft were damaged by VMF-221. That is borne out by the condition of the Japanese IJN carrier Hiryu’s Nakajima Kate squadron which led the attack on Midway. Late that day when the same unit had to deliver the desperate counter-attack on the US carriers, that squadron, having started the day with 18 planes plus three spares, was reduced to only nine Kates still airworthy plus an orphan from the sinking carrier Akagi. Had it not been for the brave Marine pilots of VMF-221 and the AA gunners on Midway, the USS Yorktown would have been attacked by up to 20 torpedo bombers instead of just 10 which would have likely inflicted on her a much swifter destruction, causing much greater loss of life amongst her crew. 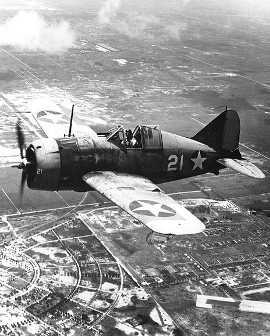 The Marines certainly played their part, as did their borther Marine pilots of the SBD and Vindicator squadrons which bravely attacked the Japanese carrier fleet. Lets not forget one of the VMF-221 pilots Marion Carl who destroyed a Kate on June 4th and then later flew at Guadalcanal in August-September 1942, becoming the first Marine Ace of the war and ending the war with 17 confirmed kills. His life ended senselessly in 1998 when he was murdered at the age of 82 by a young armed intruder who invaded his home in Oregan. i was just checking out your page. My father, Frank E. Frisk, served with VMF 221, Group 84 during the end years of WW2. I have the original patch you show at the top of the page. He died when I was 4 years old so I was never able to ask him about his time with the Marines. I do know he was in the South Pacific Solomon Islands during wars end and was in one of the first squadrons to fly over Japan after they dropped the atom bomb. I am also interested in a picture of Martin E Mahannah if there is one that exists. He only had his pilot license about a month I guess when get took off at Midway and got separated from the plane he was the wing man for. He was shot down parachuted out and evidently was shot on the way down several times. There are differing accounts of his remains. One is that he was identified and then buried at sea, one is that he is in a grave that is unidentified. It would be interesting to know. Linda, I would have to do some research as I do not know his particular story. I will se what I can find about him. MY 1ST. COUSIN,THEN LT. CHARLES W. SOMERS WAS IN THE FLIGHT OF FOUR WITH CAPT NEEFUS AND CONTRIBUTED IN SHOOTING DOWN THE JAP SEAPLANE WHICH, I THINK, WAS THE FIRST KILL AT MIDWAY. HE SHARED A FIFTH OF BOURBON FROM COL. WALLACE. 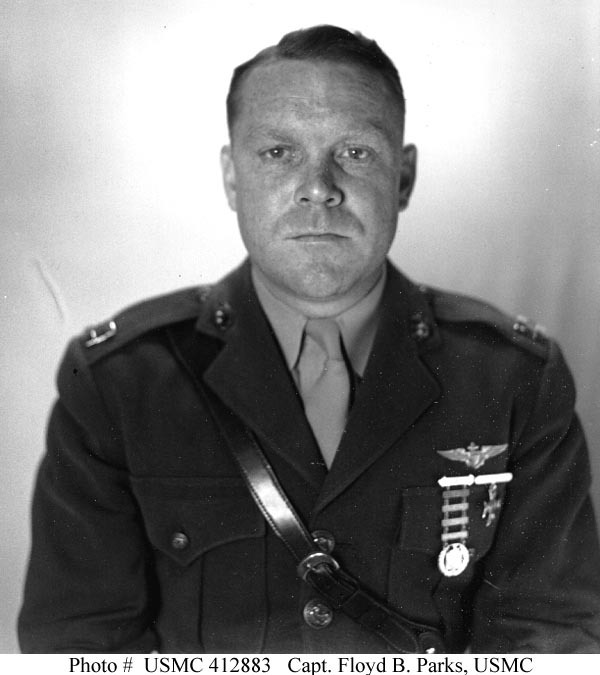 LT. SOMERS ALSO DITCHED THE BREWSTER SHORT OF THE RUNWAY DURING A NIGHT LANDING IN A RAIN SQALL. THIS PLANE WAS DISCOVERED BY DIVERS IN 2012 ALMOST INTACT. SOMERS SOON RETURNED TO NAS, EVA ON OAHU, TH. AND AS A CAPTAIN WAS THE FIRST CO OF VMF-214. HE LATER SERVED AS CO OF VMR-352 AT SIAPAN. HE SUBSEQUENTLY RETIRE D AS A COLONEL AT NAS, PENSACOLA. Padre Steve, thank you for this article. You list all the pilots of VMF 221. I wonder if you also have or have access to the roster of pilots and gunners for VMSB 241 at the time of Midway? I wish that I did. Been digging around for the better part of today and found this that has the rosters for each sortie during those fateful days. Just thought I’d let you know that I am a relative of Lt. Charles M. Kunz. He was married to my great-aunt Grace. He has been gone for at least 15 years, but my Aunt Grace just passed away within the last year. She and I are originally from Monett, MO while Charles was from Dixon, MO. Charles also went on to serve with the “Cactus Air Force” at Guadacanal. I am sorry for your loss and I admire men like your great uncle. 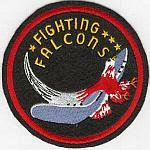 I am planning on doing an article sometime in the next few months about the Cactus Air Force on Guadalcanal. I have done a lot of study on the campaign and the men who flew from Henderson Field were amazing.